What do biology and classics have in common? In terms of subject matter, nothing really. Except that you can major in both at a liberal arts university. And use such a diverse background as a launching pad to a successful career. Those were the first steps along the path for Alex Yong ’90, now senior product designer for Major League Baseball, where he is responsible for the design of MLB.com. Yong developed a love of UNC early. 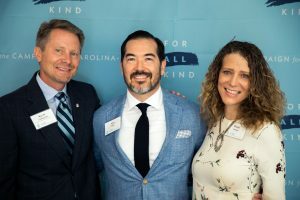 Dean Kevin Guskiewicz (left) celebrated Alex Yong and Wendi Strugis’ gift at Carolina’s For All Kind campaign kickoff in October. The connection continued to grow as he became involved in activities on campus. But a biology and classics double major? How did that happen? After working for several years in independent film and TV commercial production and meeting his wife, Wendi Sturgis, who was working for a tech startup, Yong developed an interest in digital design and technology. Knowing that technology was the future, he enrolled in the intensive multimedia design and production program at New York University and has been with MLB since 2003. Yong and Sturgis, who is an alumna of Georgia Tech and chair of its advisory board, wanted to support their universities and maximize their impact by giving sooner rather than later. In addition to significant planned gifts to the College of Arts and Sciences that benefit technology and innovation in the Learning and Writing Center, diversity initiatives in the department of computer science, and scholarships, the two have created an immediate-use fund for the Learning and Writing Center. Their gifts are reflective of their passions. They feel similarly about the Learning and Writing Center. “The Learning and Writing Center is available for all Carolina students at all academic levels, but it is particularly helpful to first generation and transfer students—40 percent of the students who visit the center are from these two groups. We believe strongly that all college students, no matter their background, should have every resource available to ensure their ultimate success. We know that a UNC degree will change the trajectory of a person’s life forever,” Yong said. Yong’s desire to give also flows from that deep-seeded love of the university. “It’s really difficult to convey my love for Carolina in words. It’s a feeling that I’ve held close since my first days there, and perhaps is stronger now,” he said. In addition to his affection, he is also grateful for current leadership and the direction UNC is going. And at its core, isn’t that what a liberal arts education and UNC is all about?